Wear blue for autism awareness tomorrow April 2nd! My school has been doing awesome spreading awareness by things like posting posters around the school with facts, showing videos in advisory classes, collecting change for autism, and selling autism t-shirts. I'm excited to wear my shirt tomorrow (plus wearing a t-shirt means I can wear jeans too - bonus!) I also have my "autism" purse that I pulled out of my closet for this month. I don't think most people would think autism when they see it, but it's shades of blue and in shapes of puzzle pieces - so it's perfect! I'll try to post a picture tomorrow on my facebook page. Linky of FREE products to use for students with autism. 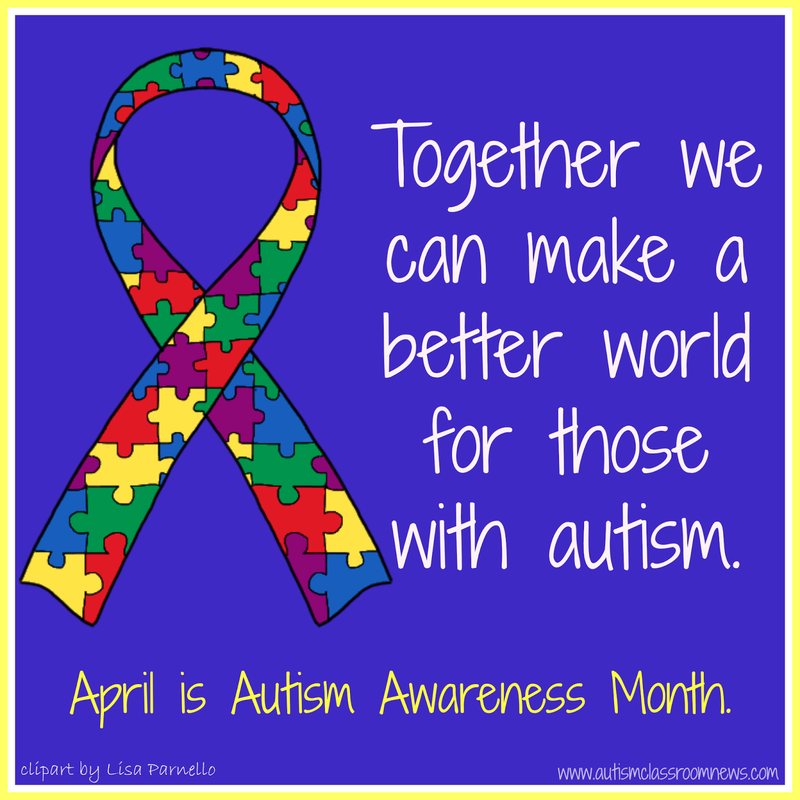 Free banners to download for autism awareness. Loving: Okay, I seriously might be loving this library unit a little bit too much, but I just feel so prepared and I love having everything ready to go. Plus, I'm excited for my kids to use everything! And then, of course, there's our trip I'm excited for too. I love the library. Thinking: I usually don't do much for April Fool's day, but put masking tape on the bottom of a co-workers mouse and it took him a while to figure out what was going on. Even plugged the computer into another outlet. And then one of my students thought he was so funny by placing a rubber mouse on my seat. Funny thing was, I didn't even notice and kept sitting down! I guess it was far enough back that I didn't even feel it. And then we took pictures of the mouse around the classroom and plan on making a book. Wanting: My little sister has spring break this week, so my family went to Florida. If my spring break had been just a week later, my husband and I would have been going along. But at least I got to see them on their way there and will see them on the way back too since we are dog-sitting for them. Needing: Warmer weather - who doesn't?! I'm looking forward to going for walks with my dog again. I'm not good at exercising just for exercising, but enjoy walking with a purpose so I can't wait to do that again. I found you through the Currently linky! Good luck on your Autism Awareness Day! My second graders didn't play any tricks on me today, but I think I beat them to the punch!